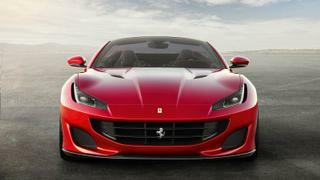 The brand new Portofino is Ferrari’s entry-level vehicle. But don’t worry, an entry-level Ferrari is neither an outlier nor an oxymoron. It is a genuine means of access to the legendary Italian brand — especially when it looks, sounds and acts like this luscious two-door. The Portofino comes with the added bonus of being a convertible, though you might not notice this at first glance; its roof is made of metal and slopes with teardrop delicacy into its double-peaked tail. The top can retract and fold itself away to offer the driver a therapeutic dose of solar-synthesising vitamin D. What’s more, it can accomplish this acrobatic performance even while under way. Equally restorative is the car’s interior. Delicious leathers cover the adult-size pair of seats up front and the smaller pair in the rear. A crisp new 10.2-inch infotainment screen sits prominently in the middle of the dash. And a special wind-blocker cuts cross currents by nearly one-third when the top is down, providing the ultimate luxury: more access to the sound of your passenger’s whoops of delight. Also, more access to the sound of the engine. In this case, a thrumming V8 that pumps out a mechanical symphony, as well as copious power. 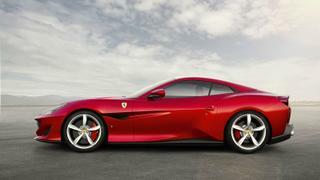 Enough to push the Portofino from a standstill to 60 mph in under 3.5 seconds, en route to a top speed of over 200 mph. Not too shabby for “entry level”. 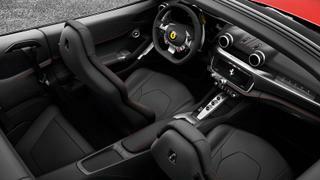 The Portofino also shows off Ferrari’s attention to detail, especially in terms of design and aerodynamics. A deep scallop along the middle of the doors offers a visual link to famed Ferraris of the past, like the Magnum PI-era 308 GTS. An angular cut-out at the doors’ base reduces visual mass. And a narrow vent hidden at the outer edge of the menacing headlamp is perfect for venting heat from the front brakes to allow shorter stopping distances. The Portofino is named for the famed resort town on the Italian Riviera. It may not be quite as good as an extended Mediterranean vacation, but it’s surely the next best thing.